Flew in to Tauranga on North Island for last leg of brilliant tour. Sarah of Envirohub picked me up and took me to Whakatane where for the next three days I met some amazing Maori from the Tuhoe Iwi and got to understand a little about their community and their culture. Before I began the talking bit of the tour I visited a local Marae or meeting house , Mataatua , the house that came home. 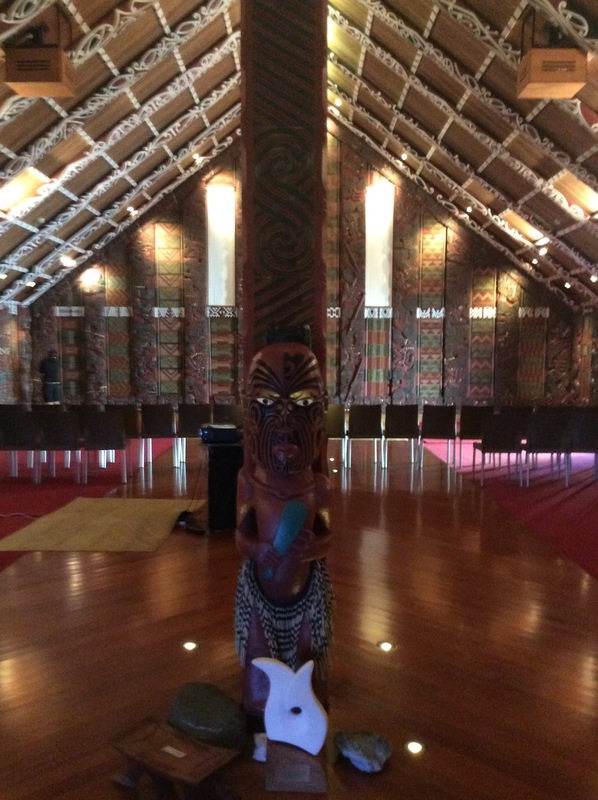 The guide spoke repeatedly of kindness, gifts, positivity and inclusiveness as hallmarks of Maori culture. Sounds familiar? Hannah who looked after me whilst in Whakatane took me to some special places from hilltop to Pacific shore. What a country! 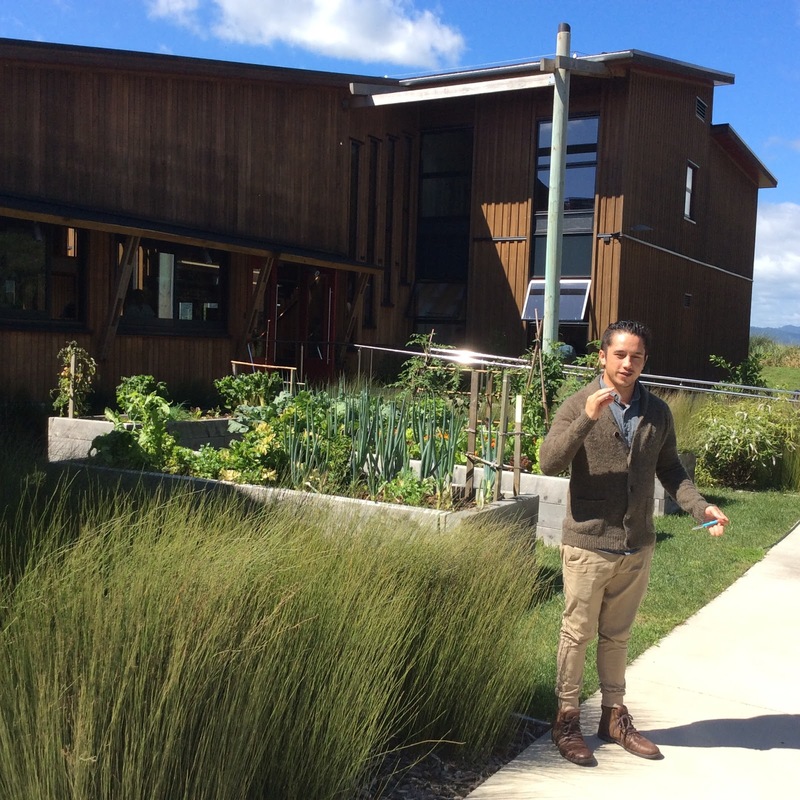 Next day visited the Te Kura Whare, or Living building a truly aspirational statement from people who want to build a kinder world. Was honoured to be allowed to present our story in the main room of the building and got a great reception from folks that are already doing this stuff and people who just needed a bit more confidence. Met Tame Iti a man who put his life on the line for his beliefs. A Tuhoe Maori activist. 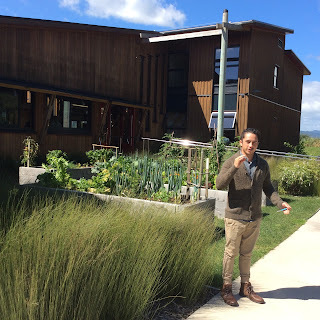 Then back to Whakatane and the community gardens, then on to some propaganda gardening around the local rural education centre care of the wonderful and loving Bonny, and over to Pip and her permaculture garden for a shared meal of local food. Last morning presentation was in Tauranga again at the Sustainable Backyards event, bit like our harvest festival in Todmorden but with lots of speakers sharing their skills and passions. Had the honour of opening the festival, and meeting Chantelle Callagher, originally from Brighton, who set up a trust called Food Finders Trust to use end of life produce to feed the homeless and less fortunate members of the community. ' nourishing our community with the abundance available' beautiful. Te Kura Whare - vege gardens. Given a tour of the building by Maia.